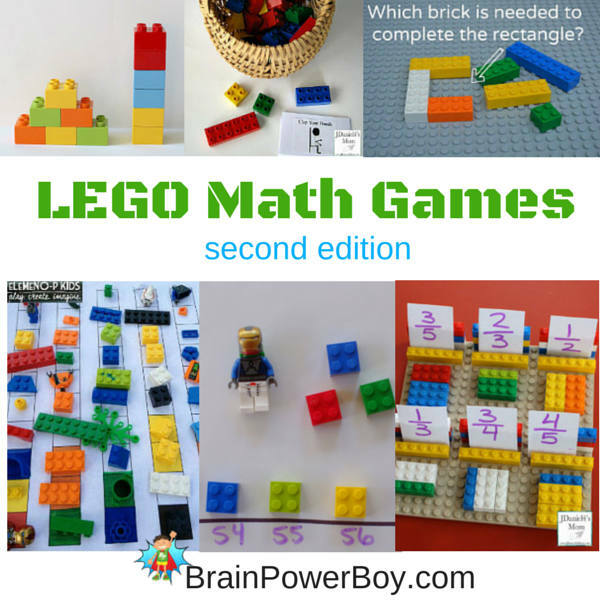 Our first LEGO Learning Math Games article was a hit so we thought we would go search the Internet and see what other LEGO math games we could find. LEGO and math go together naturally and children learn a lot of math by just playing with LEGO. I don’t advocate forcing these activities if your boys don’t want to do them, but rather I suggest setting them up and seeing if they enjoy them. LEGO is fun and combining it with math can be a great way to learn. Find a neat game here, set it up and may the LEGO learning begin! This fun LEGO Math Game features a number line and a Minifig. What I love about this (other than the fact the you use a minifig for the playing piece – so fun!) is that you can use it for learning math at any level. Make a pattern, build a number, put together the tallest thing you can with these bricks. I like this game because it really gets kids thinking . . . and building! 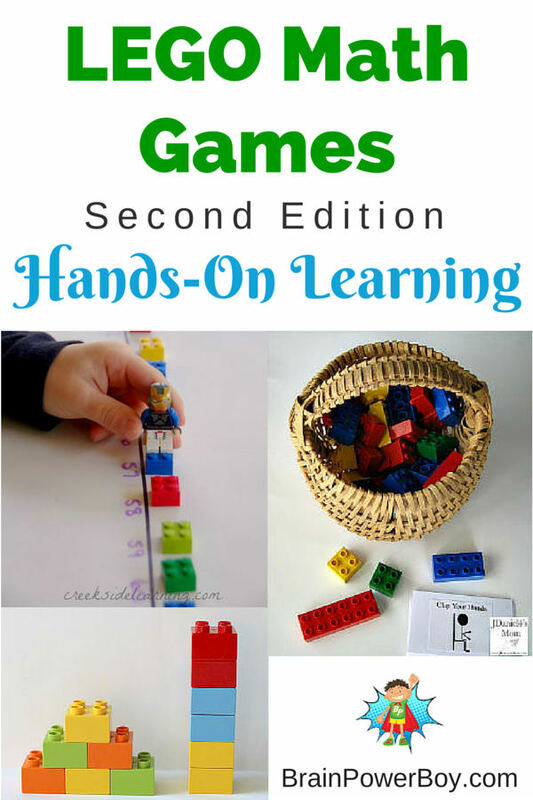 As you may know I am a big fan of hands-on learning and I like these ideas from Elemenopkids very much. The first is a LEGO hopscotch game with “brick” spaces. The second is a pattern sequencing LEGO math idea using bricks and elements. Learning fractions can be tough for kids and I love the idea of making the fractions very visual with LEGO bricks. Several different game variations are available. Here is our favorite LEGO bricks set at the moment. I am super excited that they came out with these. Ordering, measuring and problem-solving all come into play with this easy to set up group of fun math games. Many boys benefit from bodily-kinethetic learning and getting them moving helps them to remember what they are trying to learn. This idea fits just right with a LEGO Count & Move Game. Use LEGO to play around with math! If your boys like LEGO try our Huge page of LEGO Goodness and the LEGO Designs page. Know someone else (a homeschooler, a teacher, another parent) who might enjoy this? Please use the sharing buttons below to help spread the word about Learning – LEGO style. My son is OBSESSED with Lego. He will tell that to you himself too! I can’t wait to set some of these math games up for him. Thank you for the ideas! Yay! I loved your first collection of ideas and these are great too. I love that LEGO is so flexible and a great tool for homeschooling. Pinning! Thanks Clare. I kept seeing so many good ideas–I knew I had to gather another batch together. My eldest is SO into Lego and is loving these ideas! Thanks for stopping by Ellen. You are most welcome – have fun! Sheila, another great post that I’ll have to share with my daughter and her son. Love all your LEGO ideas. Great for hands-on kids. Pinned. Thanks Beth! I appreciate you pinning this. Wonderful ideas for our Summer Fun Pinterest Board! These games will keep my children busy. YAY for me time! Hi Kate, Math was not my strong point in school – that is a fact. However, I am having much more fun with it now that we can go hands-on and add some fun to the mix. I hope these work out well for you and your son. I love these fun ideas! My daughter will love learning with these! Emma! Thanks so much for the comment. I am glad your daughter will enjoy them. We loved your first Lego Math post and actually just the other day my daughter and I tried one and she loved it! It was one of the preschool math Lego games and we must have played for an hour! Thanks for sharing at our FB Share Day! I can’t tell you how glad I am to hear that your daughter played so long with one of the games! It was fun finding them – so glad you all enjoyed them. These are great! Thank you for sharing with the Frugal Family linky! Thank you for gathering so many great ways to use Legos to teach math skills. What a fantastic list! Thank you for sharing at the Saturday Evening Family Friendly Free for All. You bet – my pleasure!